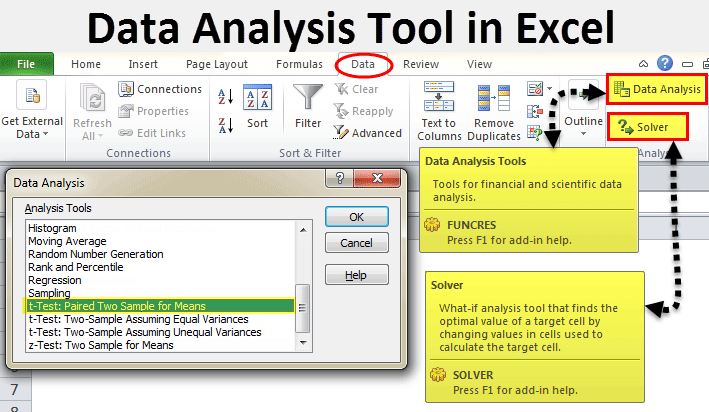 Data Analysis Tool in Excel (Examples) | How To Use Data Analysis Tool? 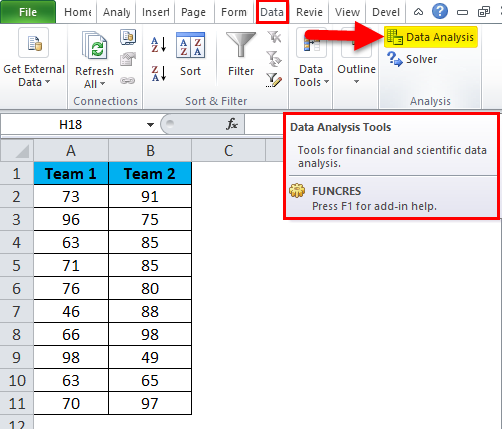 How to Use the Data Analysis Tool in Excel? Data Analysis is nothing but telling the story behind the data. We have many software’s which can help us in statistical analysis. Even though Excel is full of formulas and spreadsheets still we can do the data analysis. 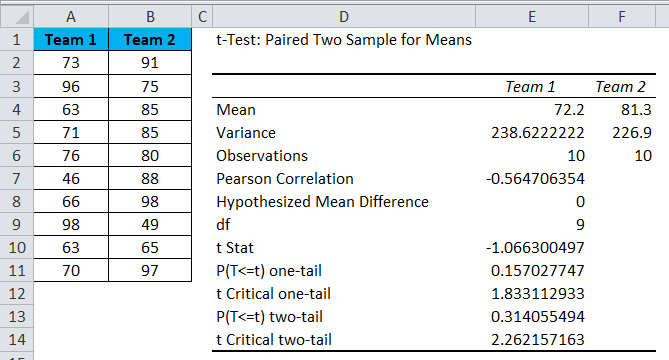 If you observe excel in your laptop or computer you may not see data analysis option by default. You need to unleash it. Usually, data analysis tool pack is available under the Data tab. Under the Data Analysis option, we can see many analysis options. 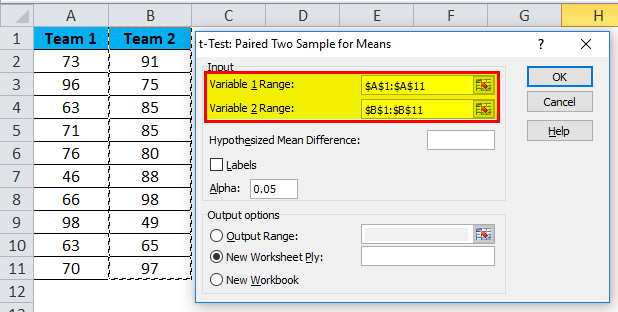 If your excel is not showing this pack, follow below steps to unleash this option. Step 2: Under File, select Options. 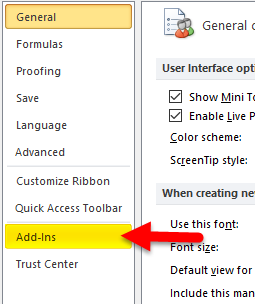 Step 3: After selecting Options select Add-Ins. Step 4: Once you click on Add-Ins, at the bottom you will see Manage drop-down list. Select Excel Add-ins and click on Go. Step 5: Once you click on Go, you will see a new dialogue box. You will see all the available Analysis Tool Pack. I have selected 3 of them and then click on Ok. Step 6: Now you will see these options under Data ribbon. Let’s understand the working of a data analysis tool with some examples. A t-test is returning the probability of the tests. 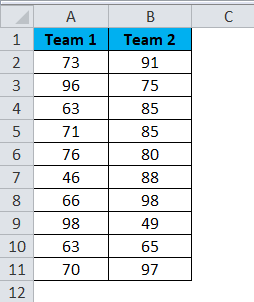 Look at the below data of two teams scoring pattern in the tournament. Step 1: Select the Data Analysis option under the DATA tab. Step 2: Once you click on Data Analysis you will see a new dialogue box. Scroll down and find T-test. Under T-test, you will three kinds of T-test, select the first one i.e. 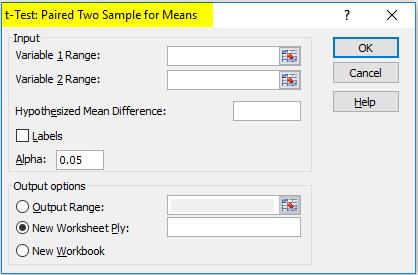 t-Test: Paired Two Sample for Means. 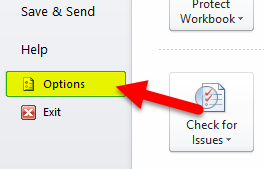 Step 3: After selecting the first t-Test you will see below options. 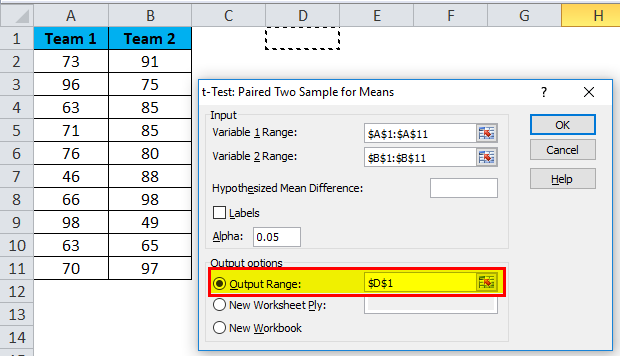 Step 4: Under Variable 1 Range, select team 1 score and under Variable 2 Range select team 2 score. Step 5: Output Range selects the cell where you want to display the results. Step 6: Click on Labels because we have selected the ranges including headings. Click on Ok to finish the test. Step 7: From the D1 cell it will start showing the test result. If you P (T<=t) two tail it is 0.314 which is higher than the standard expected P value of 0.05. This means data is not significant. We can also do the T-test by using built-in function T.TEST. A solver is nothing but solving the problem. 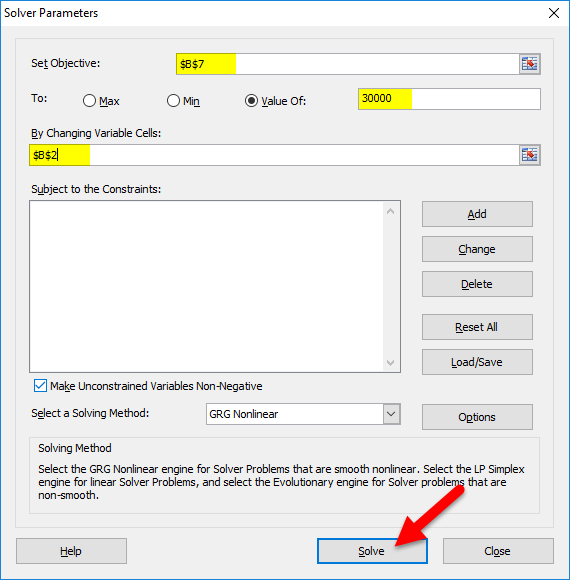 SOLVER works like a goal seek in excel. 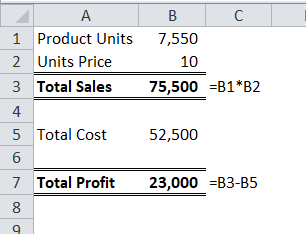 Look at the below image I have data of product units, units price, total cost, and the total profit. Units sold quantity is 7550 at a selling price of 10 per unit. Total cost is 52500 and the total profit is 23000. As a proprietor, I want to earn a profit of 30000 by increasing the unit price. As of now, I don’t know how much units price I have to increase. SOLVER will help me to solve this problem. Step 1: Open SOLVER under DATA tab. 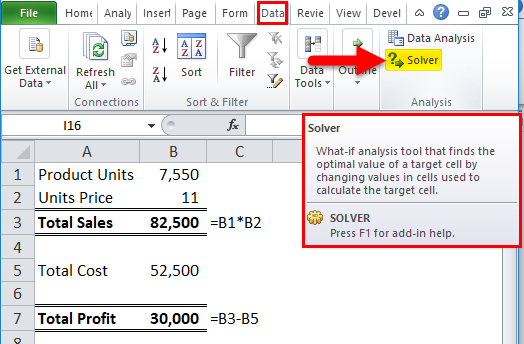 Step 2: Set the objective cell as B7 and the value of 30000 and by changing the cell to B2. Since I don’t have any other special criteria’s to test I am clicking on the SOLVE button. Ok, excel SOLVER solved the problem for me. 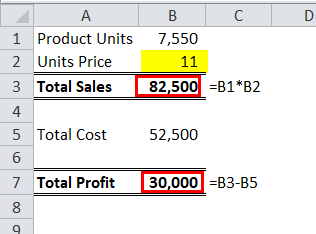 To make a profit of 30000 I need to sell the products at 11 per unit instead of 10 per unit. In this way, we can do the analyze the data. We have many other analysis tests like Regression, F-test, ANOVA, Correlation, Descriptive techniques. 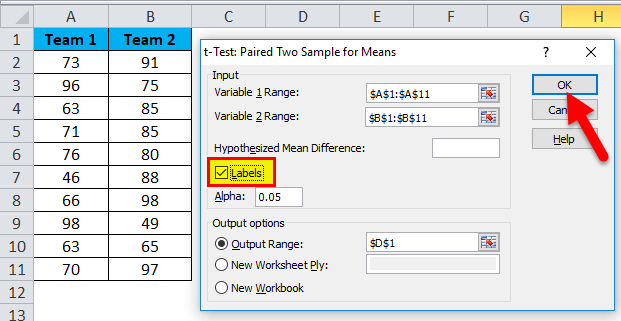 We can add Excel Add-in as data analysis tool pack. 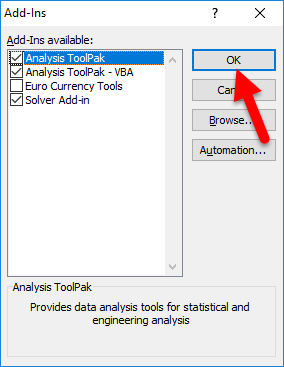 Analysis tool pack is available under VBA too.